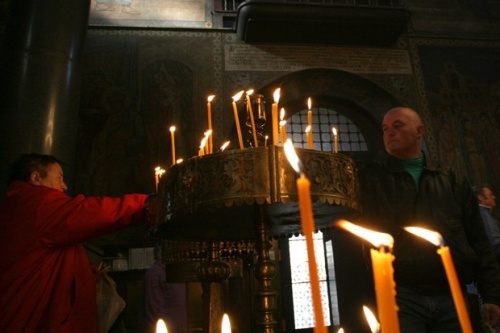 The Orthodox world, including the Bulgarian Orthodox Church, mark Saturday the Day of Saint Marina. According to the Golden Legend, she was a native of Antioch, daughter of a pagan priest named Aedesius. Marina was scorned by her father for her Christian faith, and lived in the country with a foster-mother keeping sheep. Olybrius, the praeses orientis (Governor of the Roman Diocese of the East), offered her marriage at the price of her renunciation of Christianity. Upon her refusal, she was cruelly tortured, during which various miraculous incidents occurred. One of these involved being swallowed by Satan in the shape of a dragon, from which she escaped alive when the cross she carried irritated the dragon's entrails. The Golden Legend, in an atypical moment of skepticism, describes this last incident as "apocryphal and not to be taken seriously" (trans. Ryan, 1.369). Marina was sentenced to death and murdered in 304 A.D. 304. The focal point of the celebrations in Bulgaria is the second-largest city of Plovdiv and the St. Marina church in the city where the miracle-making icon of the Virgin Marry arrived from Jerusalem Friday evening. The icon, which will remain in Plovdiv until July 21, was met by hundreds of believers and was blessed by the Ecumenical Patriarch, Bartholomew. St. Marina is a very popular and honored Saint by Bulgarians – it is said that she is the patron of health and visits the dreams of people, who believe in her to give them predictions about their future and advice how to avoid illness and bad fortune. St. Marina is also considered to be the patron of waters and the protector of the Southern Black Sea Coast of Bulgaria. This is why July 17th is also the Day of the southern Black Sea town of Sozopol. In Bulgaria, July 17 is also the name day of women called Marina and Marinka, and men called Marin and Marincho.